With this Nolo.com coupon code! The makers of Quicken Willmaker (the folks at Nolo software) are offering a special deal for those shopping from them directly this month. Save 15% instantly on the all new digital version of Willmaker Plus (discount shown when you enter coupon code “T1901” at checkout). You can also choose the boxed version but the discount level drops in half (both versions are exactly the same except the boxed one includes a physical CD disk however extra shipping charges may apply if you choose the box and/or State sales taxes may apply when ordering at Nolo.com. With your order you will also receive free access to Nolo’s Online Living Trust (normally valued at $79.99). This offer expiration is unknown. Save when ordering at Amazon. 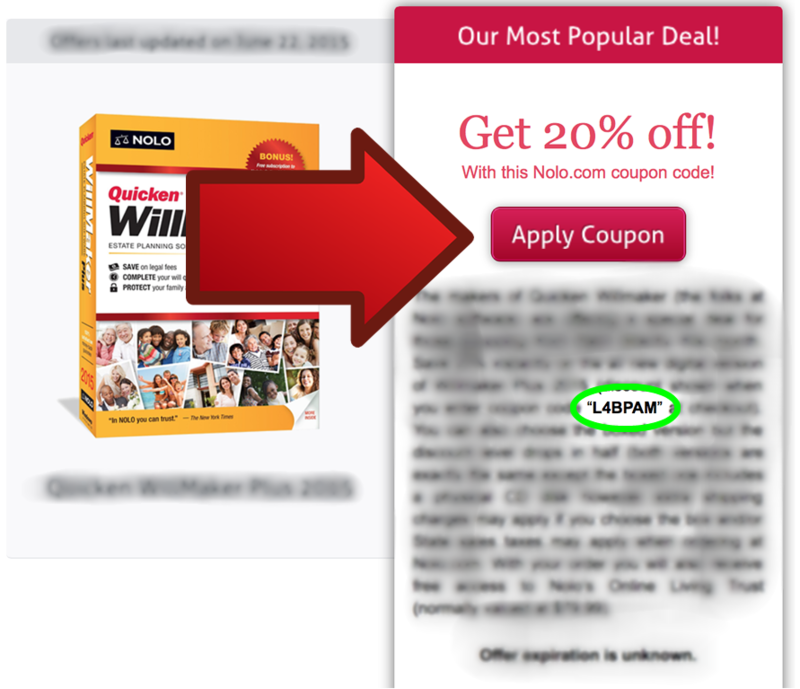 Some of the best offers for Quicken WillMaker are currently at Amazon. They have the newest version on sale for up to 35% off the retail price on bundles that include both the book and software. The copy includes free legal updates to the software through the end of 2016 as well as free access to Nolo’s Online Living Trust. Quicken WillMaker is the ideal program when planning your final will, health care directive if you get sick, and other essential life documents. When ordering from Amazon (one of their top retailers), you will get free shipping on all orders above $35.00. Discounts may vary and change without notice so see store for today’s deal. Sale prices may vary so see site for sale details. Save on the Willmaker bundle. Nolo’s put together an Estate Planning Bundle where you’ll get everything you need to easily create your last will, leave your property through a family trust, and organize all your records for your family to take over. It includes a copy of Quicken Willmaker 2016 software, Get It Together ebook, and Plan Your Estate ebook. Best of all, when bundled together you are saving 30% off the list price vs. buying each product separately. There is also no shipping costs as this bundle is deliver to you electronically (the software as a download and books as pdf documents). Complete your will & testament online. If you’re on a Mac, then you won’t be able to install Quicken Willmaker on your machine as it’t only PC compatible. But don’t worry because the folks at Nolo have you covered with their online will product. With Nolo Online Will you will be able to create a legally valid will from any computer you use and have access for a full year to finish it or to make any revisions. Plus it’s $10.00 cheaper that the PC version of Willmaker 2015 and you’re covered by a 100% money-back guarantee. See store for full offer details. Save with your Costco card! Pick up Willmarker at Costco.com. Costco has to be one of our favorite stores. They have the freshest meats and veggies, best priced wine, quality tires, and a whole bunch of other stuff that always seem to find it’s way into our cart. But one place that’s often overlooked is costco.com where they have things that you won’t find in-store, including Quicken software. And now, as long as you are a member, you can pick up Quicken Willmaker 2015 for just $39.99. Thant includes free shipping as well as one free activation of a new one year subscription to Nolo’s Online Living Trust, a $59.00 value. Must be a current Costco member to take advantage of this offer. What about a student discount? Can I take advantage of one? Unfortunately, Quicken WillMaker is not priced lower for any special groups; no student, teacher, or volume discounts are available. In fact, none of Quicken’s programs are specially priced for students. However, if you or a member of your household is currently enrolled as a full-time student, then you can qualify for up to 80% off some of the most popular software programs. We’ve identified all of the best educational offers and have posted all of the details here. How to I apply a Nolo discount code? Step 1: Select the deal that you would like to use. We always place the most popular offers up at the top of the page so you usually won’t go wrong with using that one of you are not sure which one to choose. Then if the description says that you need to use a discount code to get the discount, be sure to copy it exactly how it appears just without the quotes. You can usually just right-click on your mouse and select “copy”. Once you are finished, click the “apply coupon” link. Step 2: A window will appear and you will be taken to the store that was offering the promotion. 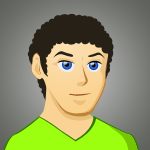 In our example this is nolo.com which happens to be manufacturer’s official online store for the product. Once on this page you will see that there are two options presented to you: a digital version and a boxed version. More often that not the digital one will be priced for less so we usually choose this option (plus you save on shipping costs and you can install the program right after you make your purchase). Add the version selected to your shopping cart. 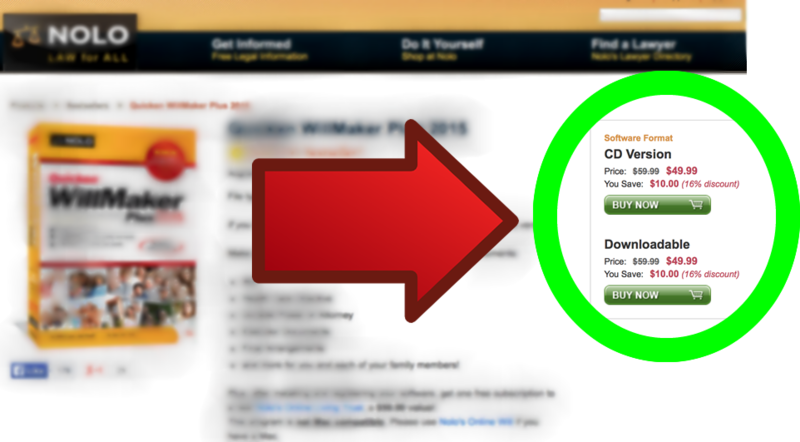 Step 3: Once a copy of Willmaker is added to your cart you will see an area when you can apply a discount code. Here you can paste the code that was copied in step one. Once it’s applied, you will see the lower price reflected and there will be a message that appears near the top of the page that the code was entered successfully (see in the example below). When will Quicken WillMaker 2018 go on sale? Be on the lookout for WillMaker 2018 to go on sale in mid-September 2017 (it actually tends to come out about a month before the other Quicken products like Deluxe or Premier). Be sure to check back for more details as we get closer to the expected release date. Can I try WillMaker for free before I buy a licence? 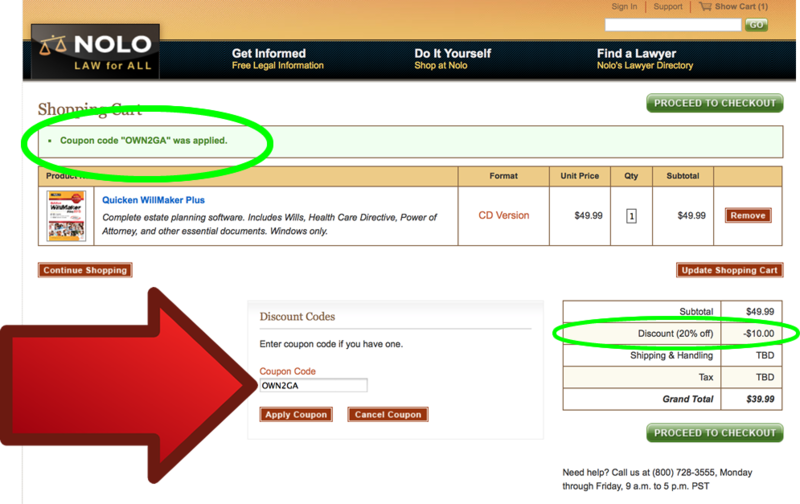 No, Nolo does not offer free trial downloads on any of their software products. 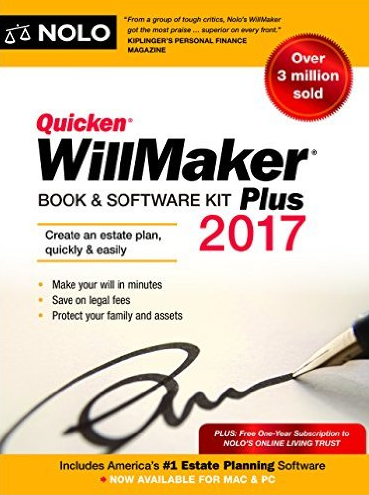 However, if you are unsure if WillMaker is the right solution for your last will, testament, and estate planning, then we recommend that you purchase your copy of WillMaker 2017 only from a reseller that offers returns on opened/installed software products (i.e. Nolo.com). Our team of deal professionals checks this and all the offer pages on Software Voucher on a daily basis... but there is always something that can slip through the cracks. That's why we kindly ask that if you happen to see an invalid deal or promo code that you please report it to us. Thanks for your support!